Jack Israel of East Windsor Volunteer Fire Company No. 1 and Josh Pohl of East Windsor Volunteer Fire Company No. 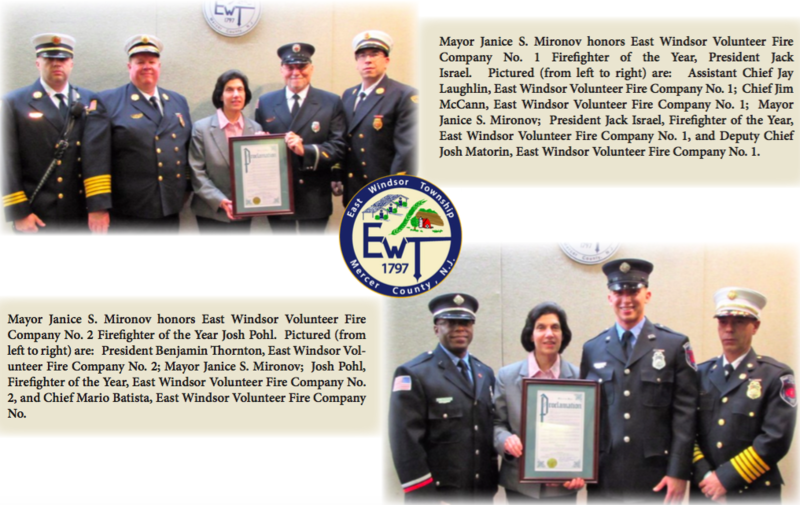 2 were presented with proclamations from Mayor Janice Mironov in conjunction with Fire Prevention Week. Jack Israel joined East Windsor Volunteer Fire Company No. 1 in November 2011 as a Fire Police Officer, and quickly ascended into key leadership roles serving as Assistant Treasurer, Trustee, Fire Police Lieutenant and President since 2015. Jack Israel demonstrated extraordinary commitment in 2017, responding to 443 calls, attending 28 training drills and 18 work details, and serving as an apparatus driver, ensuring the fire truck and members arrive to calls safely. Jack also has served on numerous company committees including the Membership Committee, Fire Prevention Committee, Dinner Dance Committee, Truck Committee and Awards Committee. In addition, he is a Life Member and served as corresponding secretary of the Mercer County Fire Police Association and is a Life Member of the Mercer County Fireman’s Association. President Jack Israel ‘s tireless efforts in all aspects of his community service have contributed enormously to the success of the fire company. Josh Pohl joined East Windsor Volunteer Fire Company No. 2 in December 2014, and has assisted in numerous company events such as open houses and fire prevention programs at the local schools. A lifelong East Windsor Township resident, Josh has actively pursued improved firefighting skills and educational advancement through special emergency response training classes, including Incident Response to Terrorism, Confined Space Awareness, Incident Command Series 100 and 200, Pump Operations, Driver’s Training, and Hazardous Materials Operations. Since joining the fire company in December 2014, Josh has responded to over 304 fire calls and numerous training drills including 127 calls during 2017. Josh Pohl, even while enrolled as a fulltime student at Arcadia University out of town, has continued to demonstrate a strong and admirable commitment to participate and respond to needs of the fire company. Thank you to all of our great fire company volunteers!